Huntington disease is a brain problem in which brain cells (neurons) in parts of your brain start to break down. 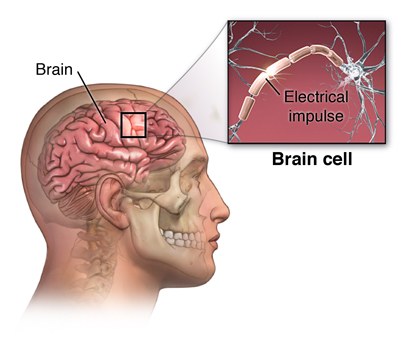 As the neurons break down, it can lead to emotional problems, thinking problems, and uncontrolled movements. Adult-onset. This is the most common form. People typically develop the symptoms in their mid-30s and 40s. Early-onset. In rare instances, children or teens will get the disease. Children with the disease tend to have sudden trouble with schoolwork. They often have symptoms that are similar to Parkinson disease. Huntington disease is a genetic disorder. It is passed on from parents to children. 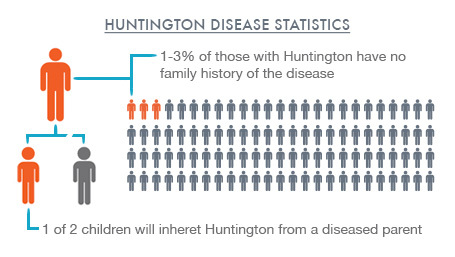 If a parent has Huntington disease, the child has a 1 in 2 chance of getting it. If the child doesn’t get the disease, he or she won’t pass it on to his or her children. For 1 to 3 in 100 people with the disease, no family history of the disorder is ever found. Poor judgment. This can cause injury or problems with the law. Many of these symptoms can be caused by other diseases, so your healthcare provider will do a detailed physical and nervous system exam. A family history of the disorder is often the biggest clue that you may have Huntington disease. Special blood tests can help your healthcare provider find out how likely you are to get Huntington disease. A CT scan of the head can help your provider assess the scope and scale of brain cell damage and loss of brain tissue. An MRI or a positron emission tomography (PET) scan may also be used. Who is at risk for Huntington disease? If you have the Huntington disease gene, you will get the disease at some point during your life. The age of onset of varies greatly from person to person, but most people get it in their 30s or 40s. Huntington disease is rare. More than 15,000 Americans currently have it, but many more are at risk for it. How is Huntington disease treated? You can’t cure or slow the progression of Huntington disease. But healthcare providers can prsscribe medicines to help with certain symptoms. Medicines such as haloperidol, tetrabenazine, and amantadine can help control the unusual movements caused by Huntington disease. Haloperidol and tetrabenazine can also help prevent hallucinations and delusional thoughts. Depression and suicide are common among people with this disease. Antidepressants and antianxiety medicines may be prescribed to treat these symptoms. You may need psychotherapy to help treat behavioral problems. As Huntington disease gets worse, you will eventually need constant help and supervision because of the debilitating nature of the disease. People usually die from the disease within 15 to 20 years of the start of symptoms. If you have been diagnosed with, or are at risk for Huntington disease, it is critical to stay physically fit as best you can. People who exercise regularly and stay active tend to do better than those who don’t. A number of studies are under way to find new treatments for Huntington disease. Talk with your healthcare provider about whether any of these may be helpful to you or a loved one with the disorder. If you have Huntington disease, your child has a 1 in 2 chance of getting it. Huntington disease affects your emotional, physical, and thinking abilities. As the disease gets worse, you will need more help and supervision. Eventually you will need help 24 hours a day.